Jesus' own powerful words from The Way of Divine Love which shows His displeasure over mankind's neglect of His love, especially of His Eucharistic Presence. Sr. Josefa Menendez was a Catholic nun and an alleged mystic. She was born to a Christian family in Madrid, where she suffered various trials. In 1920, at 29, she entered the Society of the Sacred Heart of Jesus in Poitiers. 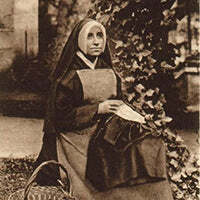 Her religious life was spent cleaning and sewing. While a nun, she allegedly received visions of Jesus.